Northen Ireland based, Restwell Manufacturing is investing over £475,000 to expand its production capabilities and workforce with support from Invest Northern Ireland. The company is recruiting 20 new jobs over the coming months, encouraging applications from school leavers and those returning to work. The Coalisland-based business manufactures mattresses, headboards and divan beds for the wholesale and retail markets. Invest NI has offered Restwell Manufacturing over £112,000 towards the purchase of new equipment, marketing costs and the recruitment of the 20 new jobs. Speaking about Restwell’s expansion plans, Director Artur Slizak, said: “Demand for our mattresses is growing across the Republic of Ireland and UK as customers look for locally made, quality products. Invest NI’s guidance and support is enabling us to quickly put in place the resources needed to take advantage of these potential sales. 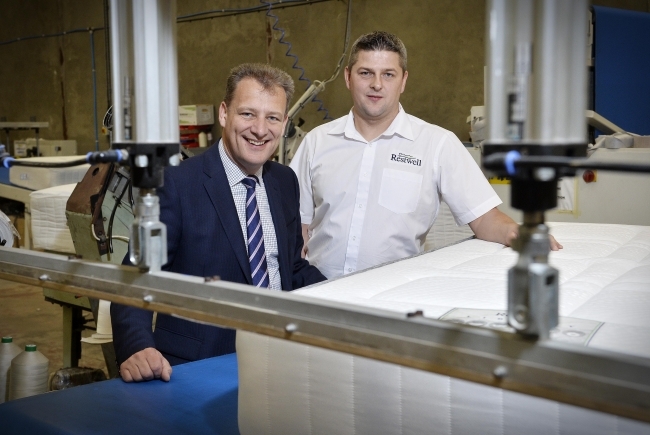 Welcoming the investment, Jeremy Fitch, Invest NI’s Executive Director of Business and Sector Development, said: “Restwell is an entrepreneurial manufacturing business which is positioning itself to take advantage of the demand among trade suppliers for simply made mattresses. “Its investment will generate over £270,000 annually in additional salaries which is encouraging news for the Mid Ulster region. The majority of the new roles being created provide the recruits with an opportunity to develop valuable manufacturing skills that will contribute to a growing industry in Northern Ireland. The 20 new jobs include 15 production operatives, two delivery drivers, a Production Manager and a Production Supervisor. Thirteen of the roles are already in place.